Sagittarius. © 2003 Torsten Bronger. 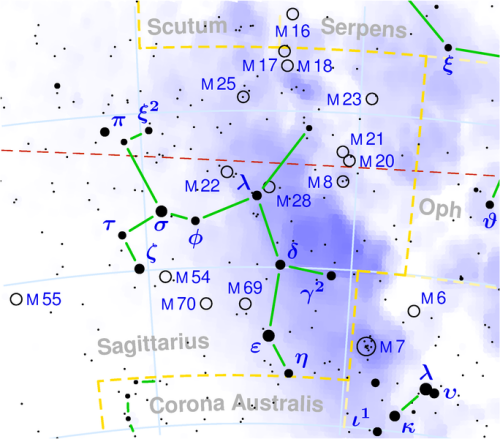 Sagittarius (abbreviation: Sgr), the Archer (actually, a centaur with a bow), is a large constellation of the southern hemisphere and ninth of the zodiac. 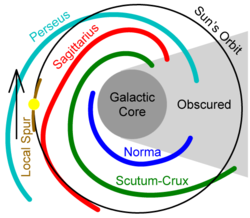 It lies north of Corona Australis, south of Aquila, east of Capricornus and west of Ophiuchus. In the center of the constellation lies the conspicuous asterism known as the Milk Dipper or the Teapot, with a spout (formed by the stars Gamma, Delta, and Epsilon Sag), a handle (Zeta, Sigma, Tau, and Phi Sag), and a lid (Lambda Sag). Rich in star fields, star clusters, and nebulae, Sagittarius straddles the plane of the Milky Way. At its very edge, at the border with Ophiuchus and Scorpius, lies the center of the Milky Way Galaxy, about 30,000 light-years distant. See below for details of the constellation's brightest stars and interesting deep sky objects. 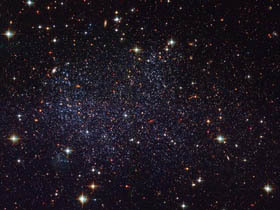 The Sagittarius Dwarf Irregular Galaxy (SagDIG, Sag dIrr) is a dwarf irregular galaxy, discovered in 1977, that is a member of the Local Group of galaxies. It has a diameter of about 3,000 light-years and lies about 3,500 light-years away in Sagittarius at celestial coordinates R.A. 19h 30m, Dec. -17° 42'. The Sagittarius Arm, also known as the Sagittarius-Carina Arm, is one of the spiral arms of the Milky Way Galaxy. It lies between the Sun and the center of the Galaxy in the direction of the constellation of Sagittarius.